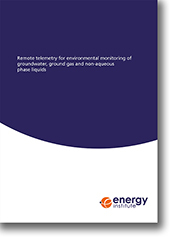 This guidance raises awareness of the applicability and value of remote telemetry technologies in environmental monitoring. It provides an independent review of remote telemetry monitoring methods worldwide, a general classification and description of general operating principles, methods and infrastructure arrangements as well as identification of key factors to consider when comparing and contrasting each technology. A flowchart guides the choice of generic methods including application recommendation for each. The guidance will assist a wide range of stakeholders, including industrial site operators, health, safety and environmental managers, regulatory authorities, environmental and non-governmental organisations, as well as consultants. While the focus of this guidance is primarily on downstream activities onshore, the principles presented are also valid for other applications like onshore well pads and/or offshore operations.